And of course, all of our products meet Australia’s safety standard requirements. We only want to offer great quality products at great prices and have happy customers – that’s the goal! So Container Door guarantees everything you buy from us for one year and we have a dedicated customer support team standing by to help you with any issue or query you may have. And of course you are covered under the Competition and Consumer Act 2010. In short, don’t worry, we will look after you! Yes, we guarantee all our products for one year offering replacement, repair or your money back for any faulty items. You are also covered by the Competition and Consumer Act 2010. We can also help source spare or replacement parts within a reasonable time after your purchase. Whatever your problem is, get in touch with us and we’ll do our best to help you out – we want you to be happy! We know how disappointing that is for you. It is for us too - especially as we do a lot of work to get a product to the deal stage. But if there are not enough customers to place an order with the factory, there’s nothing we can do about it. If all else fails, please email support@containerdoor.com.au to request a re-list and we’ll see what we can do. If you are having trouble signing up, it is sometimes because you already signed up using that address and have forgotten about it. Try clicking Forgot Password and check that email account to see if you get a reset link. Otherwise please email support@containerdoor.com.au and one of our customer service team will help you. These come to the email address you used when you signed up to Container Door. But if you’ve already placed an order using your old address details, please contact our customer services team by phoning 1800 999 747 or emailing support@containerdoor.com.au and we can update the courier instructions for you. Am I In Your Delivery Zone? At the moment we are delivering in the Sydney metro area. But we are rolling out to other cities soon – watch this space! 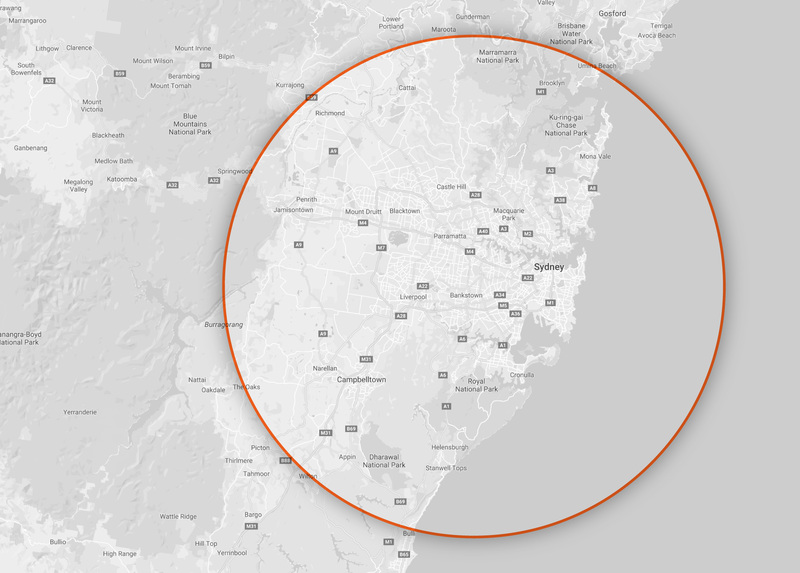 Our current delivery zone is a 50km radius from central Sydney (give or take) and our system won’t recognise any address outside our current delivery zone. Please refer to our approximate delivery map. But I Really, Really Want a Delivery Outside that Zone! Okay, sure, we hear ya. If you are really desperate to buy from us we can quote to deliver to your place, wherever you are. Email support@containerdoor.com.au and we’ll advise the cost. Can I Pick Up From You Guys? Sorry, not at this stage, but we are working on it. Your Sydney delivery charge is automatically calculated during the Checkout process when enter select your address from our pull-down menu. Then you can decide whether to proceed with your purchase or not. Easy! Also, our system won’t recognise any address outside our current delivery zone. Sorry about that! Do You Deliver To Ground Floor Only? Yes, due to health & safety issues, deliveries are made to a ground floor only - unless you have a working lift that’s big enough to accommodate your enormous package. This is at the complete discretion of the courier company. How Will I Know When to Expect Delivery? For anything you buy over $50, the courier company will advise you of the delivery date and contact you one hour prior to arrival, and a signature is required. If you won’t be there to receive it you are welcome to authorise them to leave it somewhere safe. And the courier company has asked us to tell you that they reserve the right to add an extra charge after a failed delivery attempt, so please be aware of that. Items under $50 will be delivered without a signature required and left somewhere safe. Courier tracking numbers are available on request. Please email support@containerdoor.com.au to arrange to get one. We can definitely quote you a shipping cost for a consolidated bulk order. Please email support@containerdoor.com.au BEFORE you order and we will help you out. We want you to be satisfied so please email us at support@containerdoor.com.au and we will happily assist you! © 2019 Container Door Pty Ltd. All rights reserved.